Wisconsin Gov. Scott Walker waits backstage before speaking at the Iowa Freedom Summit on Jan. 24 in Des Moines. Wisconsin Gov. Scott Walker is “surging” — all the way up to 16 percent in a new Des Moines Register/Bloomberg poll of potential Iowa caucus-goers. And he’s the second choice of an additional 9 percent of voters. But while the Des Moines Register poll had a lot of politicos talking up Walker over the weekend, it isn’t evidence he’s the new front-runner in Iowa. Instead, the survey is (more) evidence that the GOP field is historically divided. Looking at past Iowa caucus polls this early in the election cycle shows the 2016 Republican field is among the most chaotic. In fact, Walker’s 16 percent is the worst for a front-runner at this point in any open-field election (no incumbent president and no favorite son candidate) since 1980. The candidates just behind Walker are Sen. Rand Paul of Kentucky at 15 percent and former Arkansas governor Mike Huckabee at 13 percent. Both are within the margin of error. There are eight candidates within 12 percentage points of each other in the DMR poll. There’s no front-runner. 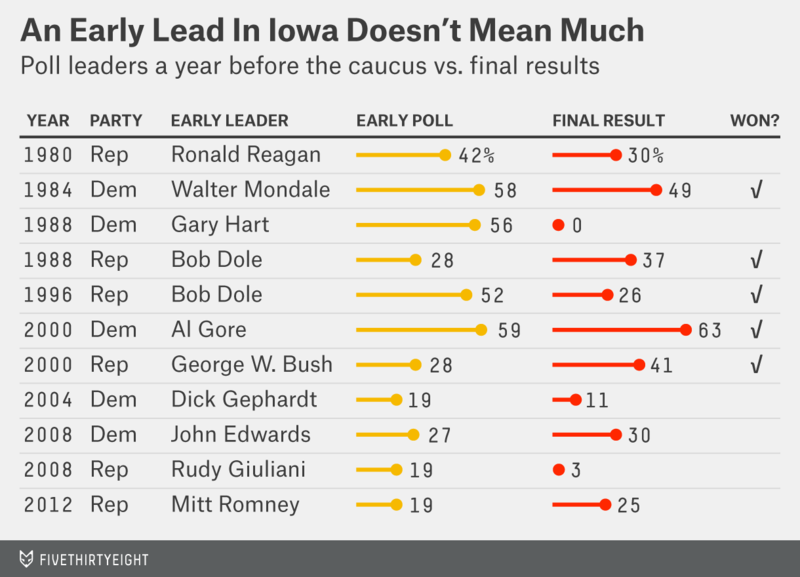 And in any case — as I said two weeks ago — the person leading in early Iowa caucus polling often doesn’t win. Of the three early leaders who were polling at less than 20 percent, none went on to win. That doesn’t mean Walker won’t win. It’s just that it’s very far from a sure thing. Based off of past caucuses, Walker has about a 17 percent chance of winning Iowa given his standing in the polls right now, but that calculation is based on just a handful of data points. Moreover, I wouldn’t read too much into the fact that Walker is the second choice of many Iowa Republicans. Yes, he’s in the “sweet spot” ideologically, as Ann Selzer, who heads the DMR’s esteemed polling unit, pointed out. “A majority think he’s got the right balance between conservative and moderate,” Selzer said. But you know who else was in the sweet spot? Newt Gingrich, one month before the 2012 caucuses. Not only had Gingrich “surged” from 7 percent in October 2011 to 25 percent by late November, but Selzer also said then that Gingrich had “the potential to grow” because he was the second choice of more voters than any other candidate. Gingrich, of course, would end up faltering, placing fourth in the caucuses. Walker isn’t Gingrich. Walker is a far more credible candidate than Gingrich and most of the other Republicans who ran in 2012. Walker’s a conservative governor from a state that hasn’t voted for a Republican candidate for president since 1984. He’s won three elections in four years. The fact remains, though, that voters are just getting to know the candidates. Walker got a lot of good press coming out of Rep. Steve King’s Iowa Freedom Summit and will now have some time in the spotlight. But that spotlight is likely to be glaring. Negative press will probably ensue. And we’ll get to see whether Walker can take a presidential punch.